If you do any kind of production ripping or milling you know what a big chore it can be feeding by hand especially with longer and wider stock. For those of you who want to increase production upgrade or add on an extra stock feeder we have a power feeder that will match virtually any application and budget. CSA certified meeting CSA C22.2 -71.2–08 and UL 987–7th standards. FEATURES:  Forward/Reverse  X Y Z adjustment  Multiple feed speeds  1 year warranty. 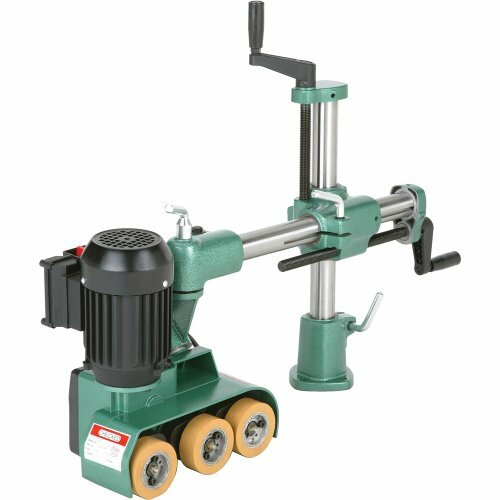 SPECIFICATIONS:  Motor: 1/4 HP 120V single-phase 2.5A  Number of speeds: 4  Range of speeds 20 26 33 43 FPM  Rollers: 3 synthetic rubber 1-3/16" W x 3-1/8" Dia.  Rotation: forward and reverse  Maximum height of rollers: 6"  Vertical movement: 6-1/2"  Horizontal movement: 10"  Shipping weight approx. 79-Pound  This is our most popular feeder..